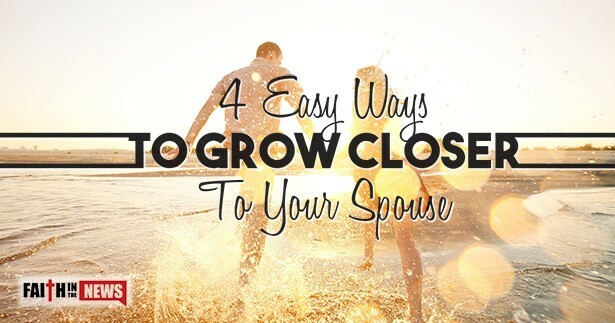 Here are four very simple ways to grow closer to your spouse. A simple “thank you” can go a long way in showing how much you appreciate your spouse. I think five of the most important words we can ever say are “I love you” and “I’m sorry” but also “thank you.” In our hectic everyday lives, we get so busy with life that we often take one another for granted. So why not send them a “thank you” card in the mail or leave “thank you” notes around the house where you know they’ll find them. Tell them thank you and express to others, in public and in front of your spouse, that you are thankful for them, and in your prayers, thank God for them. I am the least likely to suggest this because I am the worst at doing it, I must admit, but having a date night can really help you grow closer to your spouse. Instead of suggesting a place, why not let your spouse choose the place. If you already know one of their favorite places to go, then plan on going there, even if it’s not one of your favorite places. That is what sacrificial love is all about. It might be a romantic weekend at a bed and breakfast. It might be taking a canoe ride down the lake, or it even might be finding a babysitter and spending the night watching one of their favorite movies together. Make them queen or king for the day. Indulge them. Make it their night, and you’ll very likely grow closer to your spouse. This might be the most overlooked suggestion of all. I could find nothing on this subject when I was researching the topic on how to draw closer to your spouse, but to be forgiving might be the most powerful of all glues that holds marriages together, not to mention draws husbands and wives closer together. To add to some very powerful words that I mentioned in the first paragraph that can help strengthen marriage, may I suggest these: “I’m sorry,” “please forgive me,” and “I was wrong.” There is nothing that draws us closer to our spouse than humbling ourselves and admitting when we are wrong. Don’t say, “I made a mistake.” Instead say, “I’m sorry. Please forgive me.” If we simply make our faults and sins out to be “mistakes,” then we’re not taking full possession and ownership of them. To have a forgiving spirit is very powerful in a marriage, so learn to forgive. This is a must for any marriage to survive. Jesus said that He didn’t come to be served but to serve (Matt. 20:28), and remember that Jesus is God! He went on to ask, “For who is greater, the one who is at the table or the one who serves? Is it not the one who is at the table? But I am among you as one who serves” (Luke 22:27). Now if Christ “made himself nothing by taking the very nature of a servant, being made in human likeness” (Phil. 2:7), how can we not humble ourselves in serving our spouse? Love is a verb–it is what you do and how you serve others, not so much what you say or feel. Do things for your spouse when you’re not asked. Surprise your spouse by doing something that they normally do. The greatest is the servant and not the one being served, and a person’s greatness is not measured by how many servants they have but how many they serve. Today, many marriages are in deep trouble, even among Christians, so we must learn to esteem our spouse better than ourselves (Phil. 2:3). This means that we should express our thanks verbally, set aside time to be alone with our spouse on a consistent basis, learn to forgive our spouse when we are wronged but also ask for forgiveness when we are in the wrong, and, finally, be a servant to our beloved spouse, for Christ came to die for us and serve us. The greatest service ever was displayed on the cross.